The story of the Chinese Bamboo is a great anecdotal illustration of perseverance, patience, faith and trust. I love to share it with people, especially to those who are struggling to find success at reaching a goal. I fit into that category often so this story has really helped me keep my perspective. This is a story with a profound message and I’m sure you’re going to like it and remember it for years to come. The Chinese Bamboo tree has a very unique and almost magical life. It begins its journey as a seed that a farmer plants in the ground. The farmer then waters and fertilizes the soil faithfully on a regular basis with peace and patience. Even though there is no sign of growth the first year the farmer is not discouraged. He keeps on giving the buried seed what it needs to grow. When the second year has passed he smiles despite the fact that he still doesn’t see anything emerge. He just continues to love and nurture the seedling as he knows he is doing his part. When the third year comes and goes, amazingly to an onlooker, the farmer remains steadfast and resolute even though there is yet to be any signs of growth or change. No matter, the farmer shows no worry or despair or resignation. He continues to follow his routine with joy and passion. Then the fourth year comes and goes with still no apparent progress. The farmer sees absolutely nothing above the ground. The soil on the surface looks no different than when he first planted the seed. And yet he is still not dissuaded from his daily nurturing tasks. It does not seem to bother him in the least that nothing has yet been produced from all his effort. And then finally in its fifth year…a miracle unfolds. 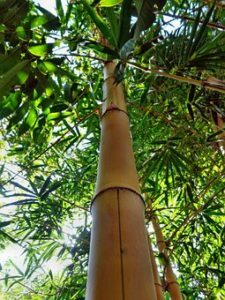 The Chinese Bamboo tree grows 80-90 feet in just 6 weeks! You could practically sit and watch it move and grow right before your eyes! How did the tree grow so much in such a short period of time, you may ask? The answer may surprise you. It didn’t grow that tall in just 6 weeks. It actually took 5 years. During all that time the farmer was being trusting and faithful, watering and nurturing the soil where he had planted his tiny seed. He knew his perseverance was not in vain. The Chinese Bamboo tree has a massive root system. If you were able to see the growth taking place below the surface it would be a wonder to behold. The small, almost insignificant seed has a timetable and instructions programmed inside it. At a pre-set time, once the root system is established and strong enough, it will shoot out of the ground and grow incredibly fast. Hence, for the first 5 years all of the action is taking place out of sight. Beneath the surface. Yet, the farmer has faith and trust that all his nurturing is making a difference no matter its outward appearance. Do you have a seed that you have planted in your life, maybe a dream you’ve had where you haven’t seen any progress yet? Are you discouraged and feel at times like giving up? Have you lost faith that you’ll ever see the fruits of your effort? Do you lack trust that your seed has a timetable to follow and it’s just a matter of doing the work and allowing life to unfold in perfect timing? Then remember the story of the Chinese Bamboo Tree. It is a reminder to be steadfast in nurturing your seeds for they have greatness programmed inside. This is one of the best stories of perseverance, patience, trust and faith you will ever read. Keep believing that your efforts will be rewarded. Just like the Chinese Bamboo your dreams, your potential to grow to new heights are inside you. Keep doing your best and never stop nurturing your dream because one day you are going to reach heights beyond your wildest imagination.